The continued advancement in the sciences of functional foods and nutraceuticals has clearly established a strong correlation between consumption of bioactives and improved human health and performance. However, the efficacy and bioavailability of these bioactive ingredients (e.g., omega-3 oils, carotenoid antioxidants, vitamins, and probiotic bacteria) in foods often remains a challenge, due to their instability in food products and gastrointestinal tract, as well as their limited bioavailability. In some cases, these bioactive ingredients may impart an undesirable organoleptic characteristic to the final product, which hinders acceptance by consumers. In addressing these challenges, development of effective delivery systems is critical to meet the consumer needs for effective bioactives. The scientific knowledge behind developing effective delivery of bioactive components into modern and wide-ranging food products will be essential to reap their health-promoting benefits and to support the sustained growth of the functional foods market. 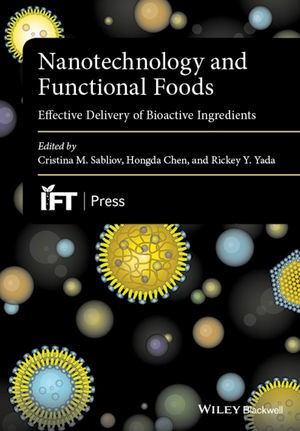 Nanotechnology and Functional Foods: Effective Delivery of Bioactive Ingredients explores the current data on all aspects of nanoscale packing, carrying and delivery mechanisms of bioactives ingredients to functional foods. The book presents various delivery systems (including nano-emulsions, solid lipid nanoparticles, and polymeric nano-particles), their properties and interactions with other food components, and fate in the human body. Later chapters emphasize the importance of consumers attitude towards nano-delivery for the success of the technology and investigate the challenges faced by regulatory agencies to control risks and harmonize approaches worldwide. The wide applicability of bioactive delivery systems with the purpose of improving food quality, food safety and human health will make this book a worthy reference for a diverse range of readers in industry, research and academia. Dr Cristina M. Sabliov is Professor in the Biological and Agricultural Engineering Department of Louisiana State University and LSU AgCenter, Baton Rouge, USA. Dr Hongda Chen is the National Program Leader in Bioprocessing Engineering and Nanotechnology at USDA – National Institute of Food and Agriculture, Washington DC, USA. Dr Rickey Y. Yada is Dean of the Faculty of Land and Food Systems, and Professor of Food Science at the University of British Columbia in Vancouver, British Columbia, Canada.